Onions represent perhaps the most ancient of cultivated vegetables, dating back to the Bronze Age, as early as 5000 BC. Or, at least the archaeological evidence suggests that onions were eaten as food at that time. Cultivation may not have occurred until 3000 BC, in ancient Egypt. There, they were worshipped as symbols of eternal life — perhaps because of the round shape and concentric rings of the vegetable. The juice of Onions is good for either scalding or burning by fire, water, or gunpowder, and used with vinegar, takes away all blemishes, spots, and marks in the skin: and dropped in the ears, eases the pains and noise of them. Applied with figs beaten together, helps to ripen and break imposthumes, and other sores. He also felt that onions “provoke appetite, increase thirst, ease the belly and bowels, provoke women’s course, help the biting of a mad dog, and of other venomous creatures, to be used with honey and rue, increase sperm, especially the seed of them.” Onions, though healthy eating, probably aren’t the panacea he claimed them to be. They do, however, contain quercetin and other compounds thought to have anti-inflammatory, anti-cholesterol, and anti-cancer properties. Onions may be particularly healthy eating for menopausal women, as they destroy osteoclasts, which break down bone tissue. Shallots contain more phenols than onions, and have much stronger antioxidant properties. Generally speaking, the more pungent the onion, the healthier it is for your body. Since onions were grown and used as a basis in nearly every global cuisine, the references to its uses are too numerous to name. It is recorded that Columbus introduced onions to the Americas in 1492 on his first voyage to Hispaniola. Long before this, they were cultivated across the Middle East, China, and South Asia. Onions left in the field produce masses of seed, which, though short-lived, germinate very well. Onions themselves are suited to a wide range of storage techniques, from freezing to powdering, so it is no wonder they have become such a universal foodstuff. 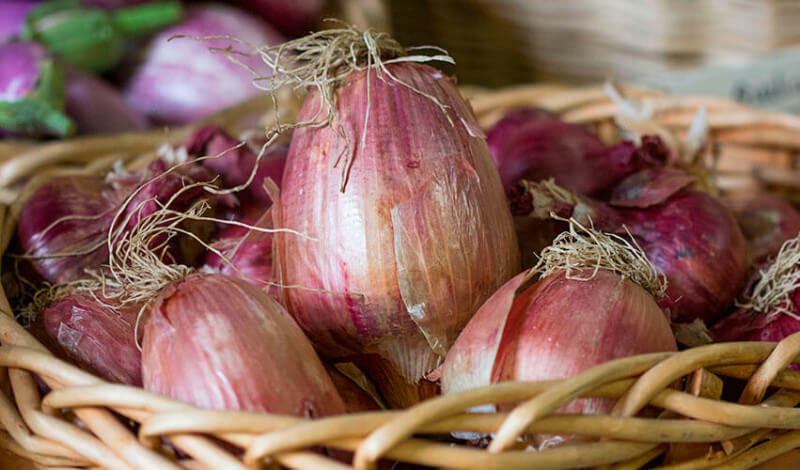 The name onion broadly includes bulbing onions, shallots, which have a similar growth form, and scallions, which are cultivated more for their green leaves than for bulbs. 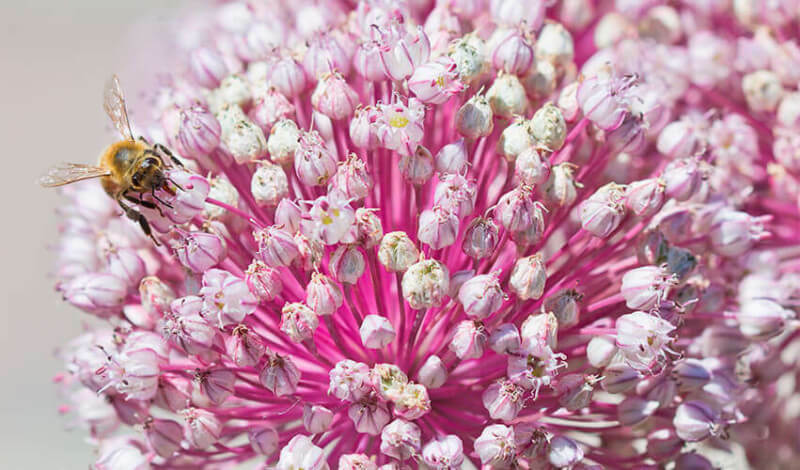 Onions in all forms (as well as leeks, chives, and garlic) derive their pungent aroma from complex sulfur compounds, which are present from the seedling stage onwards. When onions are cut, their cells are broken and they release enzymes which then break down sulfoxides within the onion tissue. This results in the release of sulfenic acids. A second enzyme within the onion rapidly converts the sulfenic acids to a volatile substance known as lachrymatory factor gas. When this stuff hits your eyes, it stings, and your eyes immediately begin to tear up in an attempt to rinse themselves clean. The effect can be reduced or prevented by slicing onions under running water, or simply using a fan in the kitchen to disperse the gas. Onions begin to form bulbs in response to temperature, but also the length of the day. In southern Canada and the northern U.S., choose “long-day” onions. Our summer days are much longer than our winter days. “Short-day” onions are better suited to growing in the south, where the length of summer days is less pronounced. These bulb-up too rapidly in the north, whereas long-day onions may not form bulbs at all in the south. Onions grown from seed may have better storage potential than the same grown from onion sets. Sets are produced by planting seeds and growing the plants densely, then lifting and drying them at an immature size. Onion sets have a “head start” on the growing season. They are planted in the spring and produce good sized bulbs by mid-summer. Perhaps not surprisingly, onion festivals abound, as many communities in North America depend on onion farming. But the town of Vidalia, Georgia, must surely set a new standard of celebration with its 12 full days of festivities. Although the official festival is only three days long in mid-April, the “pre-festival” events include beauty pageants, softball tournaments, historic reenactments, a sidewalk sale, storytelling, genealogy lessons, a carnival, a parade, and outdoor movie screenings. By the time the official festival gets underway, things really get moving. There are barbecues, hayrides, a full-scale air show, demonstrations of military equipment, a street dance, rodeo, marathon race, a car show, an arts festival, recipe contest, a motorcycle rally, an onion eating contest, the “Vidalia Onion Culinary Extravaganza,” live music, and an onion sale! The entire spectacle is overseen by “Yumion,” Vidalia’s own life-size walking onion mascot. Difficulty: Easy. Scallions can certainly be grown in containers, but bulbing onions and scallions should be grown in the garden bed. Timing: Transplanting is preferred for home gardeners: Sow 3 seeds in each cell of a 72-cell tray and transplant as a clump, spacing each 15cm (6”) apart. Seeds will emerge in 6-12 days, depending on soil temperature. Start sweet onions first, indoors in February for transplanting after April 21st. Storage onions can be treated the same way or direct sown in early April. 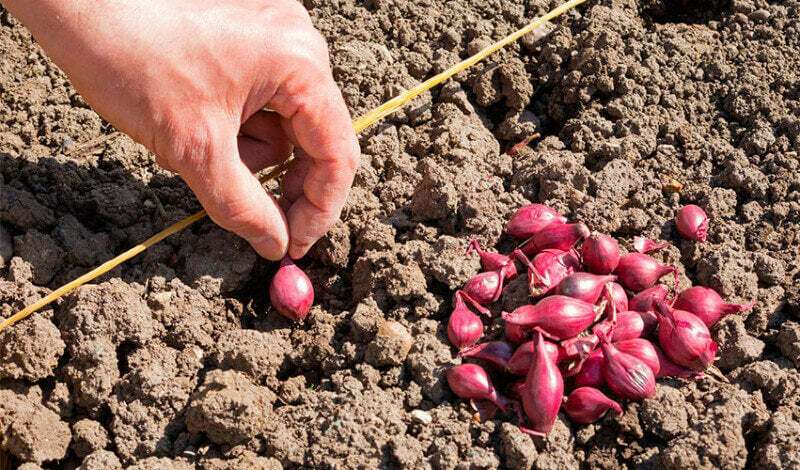 Plan to direct sow overwintering onions in the first two weeks of August. Direct sow scallions every two weeks from April 1st to the end of September, as they are a year-round crop. They will grow all winter long beneath cloche protection. Sowing: Sow fresh seeds 1-2cm (½-1”) deep. If starting indoors, seedlings can be trimmed with scissors once they are about 15cm (6”) tall. This will help to prevent them from falling over. Soil: Plant in full sun in well-drained soil. Apply lime three weeks prior to sowing or transplanting if the pH is 6.0 or lower. Dig plenty of finished compost into the onion bed. Manure can be used, but it should be dug into the bed the previous season. Glacial rock dust is a useful soil amendment for the onion bed, as it provides a wide range of minerals necessary for good growth. Otherwise, apply ½-1 cup of complete organic fertilizer beneath every 3m (10’) of row. Growing: Thin seedlings 5-8cm (3-4”) apart or wider for mammoth types. The thinned plants can be used as scallions. Most of the bulb should form on the surface of the soil, so don’t transplant too deeply. Bulb size is dependent on the size of the tops: the bigger the tops, the bigger the bulb. Keep the surface of the soil evenly moist throughout growth. Harvest: Stop watering in the beginning of August to mature bulbs in dry soil. After half the tops have fallen, push over the remainder, wait a week, and lift the bulbs Curing is essential for long storage: Spread bulbs out in the sun for about a week, covering them at night to protect them from dew. When the outer layer of the onion changes from moist to dry and crisp, it is cured. If weather is poor, cure inside. Storage: Keep onions in mesh sacks so they get good ventilation, and hang sacks where air is dry and very cool, but above freezing. Check them regularly and remove any sprouting or rotting onions. Well-cured storage onions should keep until late spring. Seed info: In optimum conditions at least 75% of seeds will germinate. Soil temperature for germination: 16-25°C (50-75°F). Usual seed life: 1 year. Growing for seed: If growing for seed, isolate each type by 1km (½ mile). Pests & Disease: Botryits blast and downy mildew are common leaf diseases. One starts with white spots and streaks, the other with purple-grey areas on the leaves. Leaves wither from the top down and plants die prematurely. Separate the overwintered and spring crops because disease starts in older plants and moves to younger. Avoid overhead watering and plant in open, sunny locations. Use lots of compost and practice strict sanitation and crop rotation procedures. Spraying with copper hydroxide every 7-14 days at the first sign of a problem may help prevent disease from spreading. 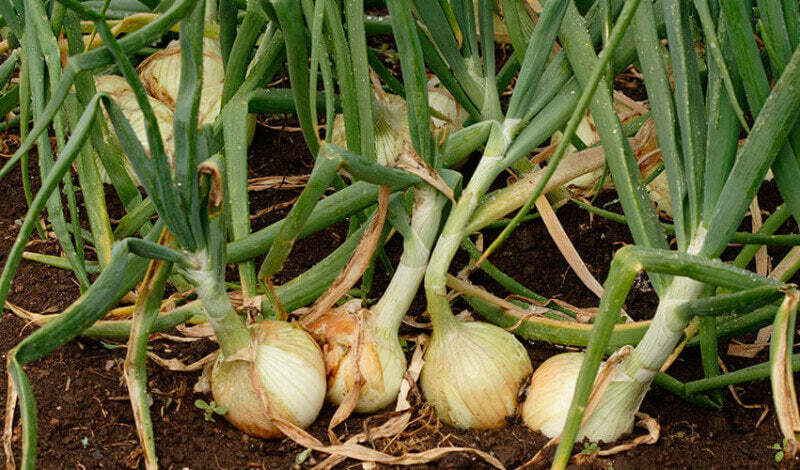 The pungent odour of onions repels many pests and also protects nearby garden vegetables.